Our HydroSpike® Dripper is a portable and deep watering solution for outdoor and container gardens. 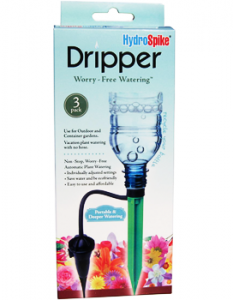 The dripper comes with an individually adjustable dial for perfect watering dependent on your plant’s needs. Adjust for your plant’s water needs by simply setting the dial to the right setting for your garden plants and vegetables. 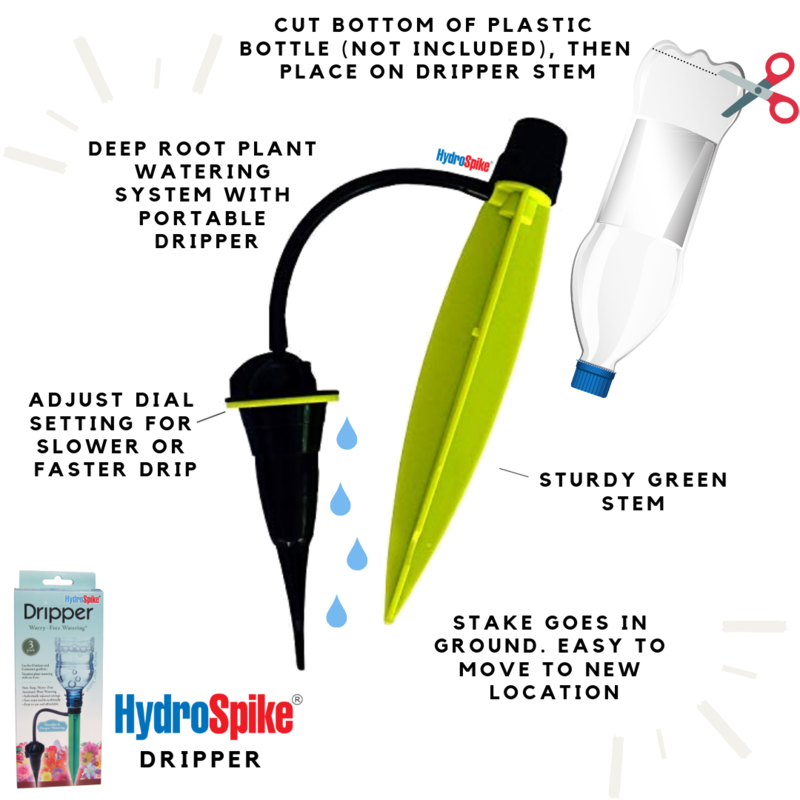 HydroSpike Dripper is designed for portability, requiring no hose. 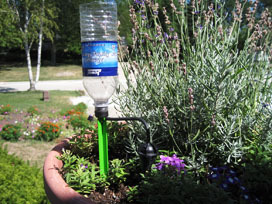 It is easy to use for outdoor and container garden watering. This product is wonderful for outdoor gardening and hot weather. 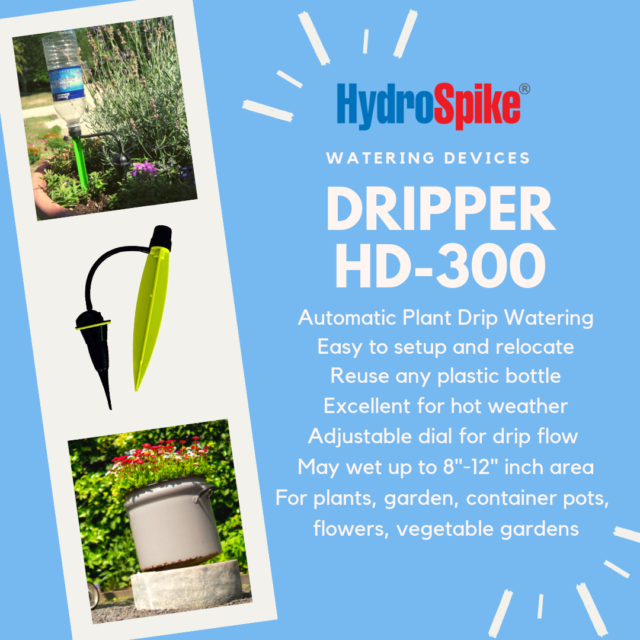 The drip system provides deeper watering for healthy plants. Each HydroSpike Dripper Head may form up to 8″-12″ wide wet area. Adjustable dial emitter settings on drippers stake allow you to tailor water drip drop flow by plant, zone area, hydration needs or soil condition. Save water and from over-watering. Flexible drip zone changes can be made by moving dripper stakes. Portable and flexible for where your plants need most water. No need to for an attachment or permanent water hose line to limit where you water. If you go on vacation and need water to the plant pot instead of flower bed, easily move the stake to another location. Great for hot weather, landscape, potted plants, on the patio, and as garden gifts! Water your flower pots or tomato garden anywhere. No need to hook to a pressure water line. No hose, no electricity, no batteries no controllers or needed meter as the dripper will continue slow drip based on the adjusted settings on each individual dripper. Find a bottle that fits the dripper. Cut bottom of plastic bottle, fill, adjust dial settings and you are ready to self water!